Get aggressive performance from your wedges with a Milled Grind Standard Bounce Wedge from Taylor Made. To engineer this wedge to have outstanding performance, Taylor Made sought out input from some of the World’s best golfers to design its advanced milling features. It features an exact leading edge, sole geometry, and score lines through its surface milling techniques that create mind-blowing turf interaction, accuracy, and consistent distance. For improved performance for all levels of players, Taylor Made crafted three different wedges with different milled grinds to suit the swings and turfs of a wide range of players. A median ground resistance is outfitted on this Standard Bounce Wedge design. 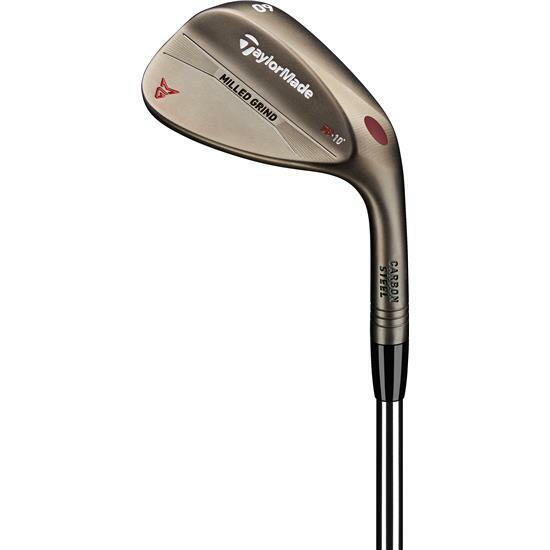 A great feel, precision performance, and better balance are achieved through the combination of the wedge’s fresh face groove design and soft 8620 carbon steel construction. The wedge has a forgiving and sturdy construction by removing weight from the hosel and locating it near the sole’s heel with a polymer-filled Precision Weight Port to provide a performance-enhancing CG location. This weight also creates a better connection with the shaft by using a 1.5-inch bore and shaft insertion, whereas prior generations used a 1-inch depth. You are about to post a review for Taylor Made Milled Grind Standard Bounce Wedge based on your knowledge of its playability. This review will show up under all variations of Taylor Made Milled Grind Standard Bounce Wedge, including new, personalized, and custom logo.